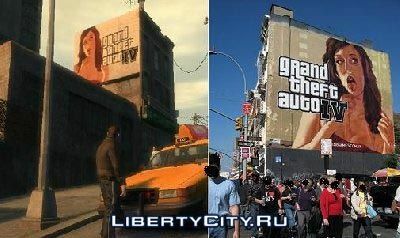 This is an advertisement for GTA 4 on the streets of Liberty City. Exactly the same advertising banner was hanging in New York before the console output of the game. Now you can fly in GTA IV by airplane! Играйте в GTA 4 в игре GTA 4 !!!! А это типа: - Играйте в GTA 4 в игре GTA 4 !!! !